I spent the morning training for my upcoming triathlon. The lake is still pretty cold. It has warmed up enough to allow for some real swim time in. I still don't think I am up to half a mile though. Plus as I have been telling everyone, swimming just destroys me. So that is going to be pain come race day. Out of the water I tried to get ready and go for a run. That didn't work out too well. I was hoping three miles and that didn't happen. After the first mile my toes went numb. It felt like running with sand in my shoes. So that is going to need some work as well. The biking part I have nailed cold though. It is Thursday, so I went out with the guys from Point83 again. First I had to bike into the city. I have gotten quite used to that. I grabbed a hot dog and hung out for a bit at Westlake. When everyone was there, we all took off and rode around Cap Hill for a bit. Meandering down side streets to 24th, then down the big hill. I was just blasting down the thing. Well, at least until I dropped my chain. So I coasted to the bottom and had to stop and gear up again. From 24th, we crossed the Montlake Bridge and headed into the marshes north of the UW stadium. 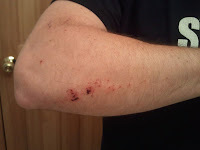 I ended up sliding out around one of the corners on some gravel. Scratched up my arm a bit. Nothing broken though, only really hurt my pride. We hung out on the shore of the lake for a bit. Talking. Setting things on fire. Playing chicken. Generally carrying on. Then it was off to Baranof for some Karaoke. Hung out and sang quite badly. Then I rode off for with a group headed south. It almost turned into a disaster. One of the guys ended up crashing into a Taurus. But no real harm done. So we were back to Cap Hill for pizza. Then I was off back to Issaquah. Always fun at night in the rain.